I am so pleased, I finished Cornelia this morning. I had just enough thread. I am so glad you had just enough thread. It's very pretty! Well done, it looks fabulous can really se the thread when it is enlarged. What was the colour and is it 80? It turned out really well. The color certainly does compliment the pattern! Sherry, I had about eighteen inches left, it was really touch and go. 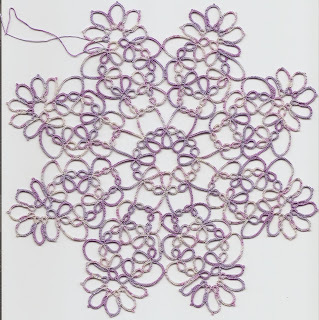 Tatskool, no, not my usual 80, this was silk, Vickie's Lilacs, from LSM, and size 20, although it squashed down quite fine. I am now using some Gütermann quilting thread, size 100, so I am averaging out! It does look really silky, so how many skeins did you use? 18 ins that really was pushing it, i bet your picots got smaller and smaller! Snowy, it's beautiful! I"m glad you had enough thread to finish it. Now what will you take to Australia? Tatskool, I had two skeins, 40 yards I think. Yes, tiny picots, and squeezing the shuttle through tiny rings. Diane, I have started a bookmark but am taking Myra Piper, plus the gecko pattern and maybe the Chinese Dragon? I will probably not do any of them! Very, very pretty! Good thing you had enough thread! Hi Snowy! It looks beautiful! Thank heavens you had just enough thread. Wow, a splendid effort of managing thread for this beautiful doily. Such a pretty color too. It really compliments the pattern nicely. Brava!